This luxurious resort is the only "Boutique Hacienda" in Costa Rica and like a true Hacienda, is defined by its exceptional home-style service culture. Warm, friendly and graciously attentive, the resort's team offers a truly memorable vacation experience. Perched atop the lush mountains of Pérez Zeledón in southern Costa Rica, the resort offers a picture-perfect setting. Spacious casitas and intimate suites offer the finest of country living with stylish furnishings and expansive views of the surrounding mountains. Take advantage of the on-site equestrian center, tour the organic farm, or simply lounge in the sun next to the sparkling infinity pool. 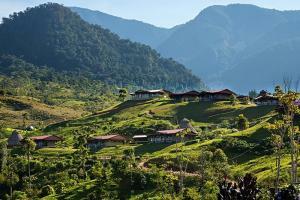 Located in southern Cosat Rica, approximately a three-hour drive from San Jose International airport.